Spring has sprung which means it’s time to grab your girls for the ultimate weekend road trip! Whether you’re hitting the 10 freeway en route to Coachella in Indio, Calif, or heading out of NYC to the Hamptons, there are plenty of road trips to be had this spring and summer. I recently went on a relaxing getaway to Santa Barbara with my friends at Chevrolet, where I got to drive the brand new electric Bolt EV to enjoy a few fun-filled days in the sun with my girls. And I obvs had to go equipped with all of the best products to make sure my mane was on point all day long. Below, the only nine products that you need to survive your next road trip in style! I never go on any trip without my T3 Convertible Curling Iron in tow! Not only is it the cutest curling wand ever (white with rose gold accents which is perfect for an Instagram flat lay!) it’s convertible and easy to tote around in your bag. It has five adjustable heat settings, and it has an auto turn-off function after an hour, which is perfect for people like me who are constantly worried about whether or not you left the iron on. I’m always on the hunt for the perfect soft hair spray that gives enough hold without turning your hair into a helmut. Enter: R+Co’s SAIL Soft Wave Spray, which adds the perfect amount of natural volume and texture, while still setting your style. I like to use this after curling my hair with aforementioned curling iron to set my look. Also, the scent is soft but oh-so-delicious with hints of Juniper berries, blood orange, and dark woodsy notes. No more hair don’ts! That’s the mantra of our Editrix-in-Chief, Jen Atkin, who teamed up with Chloe + Isabel to make a super stylish line of hair accessories that will help you elevate even the most basic hairstyles. My personal favorite is the Chloe + Isabel Deco Bun Cuff in rose gold. Clearly, I’m a rose gold girl 😊 This pretty piece saves me time and time again when I’m in a pinch and it’s the perfect accessory to bring on your next road trip! Do you want that perfectly textured, undone hair? Well if you weren’t blessed with the genes, Ouai’s Wave Spray will help get you there. This product is my on-the-go savior. Whether I am rushing out after rinsing off from a day at the pool, or need to get ready in a quick pinch for dinner, I use Ouai’s Wave Spray on wet or dry hair for that effortless, off-duty wave. I have been a devout Elizabeth and James Nirvana Black fragrance wearer for the past three years. So needless to say when Mary Kate and Ashley Olsen decided to add an Elizabeth and James Nirvana Black dry shampoo to their line of spray perfumes and perfume oils, I had to add it to my stash, stat. 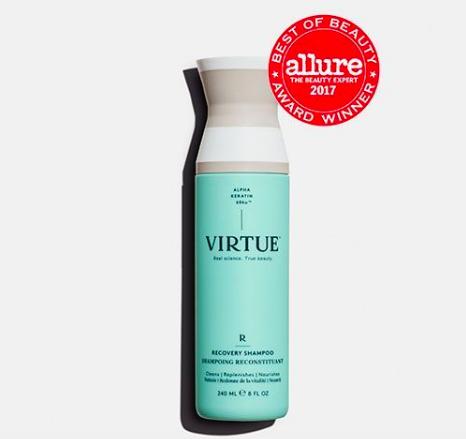 This dry shampoo instantly refreshes lifeless, sad hair thanks to it’s unique formula of water-free micro powder, natural rice starch and pro-vitamin B that absorbs excess hair oil and boosts volume. Also, the scent is major and has an inimitable blend of woody sandalwood, violet and vanilla. I have bright red hair, and as someone who dyes their hair a lot, hair dryness is just apart of life. I have to be very regimented about doing hair masks and treatments, along with a great hair oil and consistent haircuts. I’ve been known to dabble in the hair oil space, but one I keep going back to again and again is Rodin’s Luxury Hair Oil. Sure, it’s expensive. But it has a magical formula that’s specifically designed to restore health and shine to dull strands. It’s an absolute must for those whose daily routine includes blow drying, hot irons, or frequent dye jobs! I don’t leave my house for a road trip without a good baseball cap. Dad hats are all the rage RN, and personally I’ve had this Kylie Shop Lips Dad Hat on repeat. Perfect for protecting your hair and face on a nature hike, or even when you’ve got the top down in the convertible! Plus, if you color your hair like me, it’s a good idea to protect your color from the sun if you can. If you’re having a lazy day pool side, or are indulging in a glorious spa day, why not treat your hair to a little R&R too? I love to let a treatment mask, like Living Proof’s Restore Mask Treatment, sit in my hair all day long–especially if I plan on going into the steam room! I never go anywhere without my beauty gummies! Consistency is key when it comes to seeing the best results with supplements. Right now, I am all about Olly Nutrition Undeniable Beauty gummies because they deliver a high power punch of biotin, borage oil and powerful antioxidants that help you look your best, 24/7. What products do you always have with you on your weekend getaways? Let us know below! Also, don’t forget to shop my faves.